The Philadelphia Eagles are Super Bowl champs after taking down the New England Patriots in a thriller. It is no surprise that the greatest offensive showcase in Super Bowl history involved Tom Brady. It is very surprising that he wasn’t the winning quarterback. Instead, it was Nick Foles and the Philadelphia Eagles who withstood the New England Patriots machine to win Super Bowl LII, 41-33. With a little over two minutes remaining in the game, it seemed as though the old adage “never count out Touchdown Tom” would be proven true once more. Brady had just started driving the Patriots down the field for what appeared to be their eventual game-winning touchdown. Instead, Eagles DE Brandon Graham stripped Brady on a pass attempt and Philly recovered. The Eagles turned that into a field goal and held off a last-ditch effort by the Pats to seal the upset victory. One of the most entertaining Super Bowls ever, the game broke the record for most combined yardage and did so in the third quarter. The two teams finished with over 1,150 total yards. Just to drive home what an offensive slugfest this was, the Eagles punted once and the Patriots never punted the entire game. The Pats’ 33-point output is also the most of any team not to win the Super Bowl. The Patriots are the first team in Super Bowl history to go the entire game without punting — and they still lost. The real story of the game was Eagles QB Nick Foles. A backup until team leader and MVP candidate Carson Wentz went down with a season-ending injury, Foles was thrust into the spotlight and responded by leading the Eagles all the way to the Super Bowl. Once he got there, all he did was throw for 373 yards and three touchdowns. 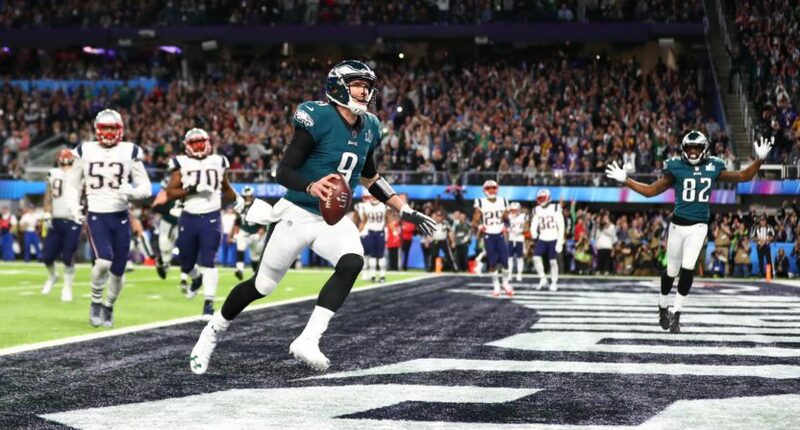 Foles also caught a touchdown on a double-reverse on fourth down right before the end of the first half that will go down as one of the ballsiest and smartest plays in Super Bowl history. Not only was that Foles’ first Super Bowl touchdown reception, that was his very first NFL reception ever. Not a bad way to cap his improbable run as Super Bowl MVP. Nick Foles in the postseason: 77 of 106 (72%!! ), 971 yards, 6 TDs, 1 INT. And he caught a TD in the Super Bowl. For the Patriots, they certainly went down fighting. Brady ended up throwing for a whopping 505 yards and three touchdowns in the losing effort. They were never really able to establish any kind of running attack, forcing Brady to overcompensate. He connected with Danny Amendola for 152 yards and Rob Gronkowski for 116 yards and two touchdowns. One play that will likely be remembered for the way it was mirrored by Foles’ big catch was this drop by Brady on a double-reverse pass. The catchable ball slips through Brady’s fingers and there’s bound to be some metaphorical value in there. One of the more surreal subplots of the game involved the referees reviewing two different Eagles touchdown catches to ensure that they were, in fact, catches. In both instances, it seemed rather clear to most people that they were indeed catches but given the way the NFL has handled the “what is a catch” drama this season, fans certainly expected to see at least one of them get overturned in the Patriots’ favor. However, cooler heads prevailed, including on the Eagles’ final and game-winning touchdown. Is this where the mighty Patriots’ dynasty starts to finally end? Who knows. It’s too early to predict such things and for all we know this could be another blip on their road to future success. But today belongs to the Philadelphia Eagles, who looked like Super Bowl contenders in November, looked like also-rans when their star QB went down with an injury, and ended up winning the Super Bowl anyway in an unrelenting scorefest, going head-to-head with the greatest postseason QB in NFL history.